Abbas got a ‘wedgie‘ from Olmert last week and seemed to enjoy getting it…. pretty sad seeing as it was his entire nation that was humiliated, not just him. Also pretty sad that the best analysis that I found on the situation comes from a foreign journalist, not a local one. 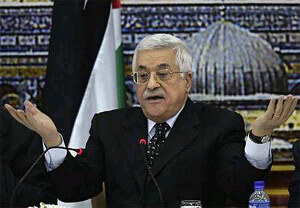 But, it is worth reading and raises some interesting questions as to whom Abbas actually represents. The following is from DissidentVoice…. The recent “peace” overtures between Israeli Prime Minister Olmert and Palestinian Authority President Abbas do not promise significantly improved conditions for Palestinians or an end to the Israeli occupation. More likely results include intensified efforts to split the Palestinian public and undermine their legally elected government. The meeting has been portrayed as an opening to relations between Israel and the PA that “boost Abbas” and exclude Hamas altogether. Olmert, Abbas, and their backers in Washington and Europe have insisted that Hamas, the popularly elected majority party, “renounce violence” and “recognize Israel’s right to exist.” These are the stated objectives of the crushing economic blockade that Israel and the western powers have enforced against occupied Palestine since last March. Objectively, neither demand has much substance. Hamas recently renounced violence by maintaining a unilateral ceasefire for well over a year. The same period saw a steady escalation of Israeli raids, arrests, killings, and settlements in the occupied territories. Everyone, including Israel’s general staff, knows that Hamas would return to a ceasefire if it thought Israel were serious about reciprocating. Hamas leader-in-exile Khaled Meshaal’s recent proposal for a 10-year ceasefire was summarily rebuffed. It is not Hamas that is launching most of the rockets into Israel these days, but the Al Aqsa Brigades attached to Mr. Abbas’ Fateh Party, seconded by the Al Quds Brigades of Islamic Jihad. And all the Israeli casualties and destruction caused by the last two years of Palestinian rockets would not equal the damage wrought in one average week of IDF operations in occupied Palestine. The Olmert-Abbas “mini-summit” provided more evidence of the insincerity of the “renounce violence” demand when Mr. Olmert failed to get even a pause in the firing of Al Aqsa rockets before his meeting with the leader of Fateh. As for “recognizing Israel’s right to exist,” we simply note that Israel has yet to recognize the state of Palestine’s “right to exist.” Israel currently forbids a Palestinian state and negates the Palestinians’ national rights daily with its strangling military occupation. Under the circumstances, it hardly seems unreasonable for Hamas to withhold recognition of this “right to exist” until it is reciprocated in word and deed. The problem, of course, is that a PA run by Hamas cannot be considered fit company in any “peace process” with Israel until Hamas meets both demands, as Fateh is supposed to have done in the past. The “peace process” operates under a bifurcated system of precedent, in which every concession made by Palestinian leaders has been irreversibly chiseled into stone, while numerous Israeli promises have been erased in practice and will have to be won again by Palestinians in future talks. Today, in the 40th year of Israel’s occupation and creeping annexation of their remaining land, Palestinians have little left to hold on to but their national rights, and their obstinate refusal to part with them. No one familiar with the history of the “peace process” can be surprised by polls that continue to show a majority of Palestinians supporting Hamas and its refusal to recognize Israel’s “right to exist,” at least until it is returned in kind. Yet the stated subtext to the economic blockade of the PA has been to “convince the Palestinian people” (by driving them into destitution) to abandon Hamas in favor of the more “moderate” Fateh. Presumably, an informed strategist would know that the majority of Palestinians would reject this blatant attempt to undermine their voice. It might even harden support for Hamas and its allegiance to principles. If so, the policy must have been directed at the minority response. What was the likelihood that deepening poverty, accompanied by a bloody military siege and internal strife, fanned and sometimes instigated by Israeli agents and collaborators, would drive a sizeable number of people to capitulate in the arms of Abbas? This was, after all, one of the stated objectives of the project. Politically, this would be considered “pushing a wedge issue”, a calculated effort to divide an electorate along ideological lines, usually for one’s own political gain. In this case the electorate is not the constituency of the politicians “pushing the wedge”, but the Palestinian people, the impoverished and land-robbed victims of the modern world’s longest running illegal military occupation. While Mr. Olmert and his wife recently shared herring in lemon sauce with Mr. Abbas in a sunny East Jerusalem villa, the PM’s aides pulled out all the stops to project the image of Abbas as “just like any other head of state.” They even (flouting the law) flew a Palestinian flag. The Christmas “gifts” from Mr. Olmert included 100 million dollars of the PA’s own tax revenues, which Israel has refused to turn over since the elected Hamas government took office last March. Since Israel’s take in this heist is now estimated to exceed 800 million dollars, the pittance given to Mr. Abbas had the air of hush money paid by organized crime. Most of it will be used to pay down the PA’s debts — to Israeli creditors — and then only after Israel is satisfied that Hamas will never see it. As Olmert was willing to part with only one-eighth of the Palestinians’ money, he may consent to removing one-eighth of the Israeli army’s “roadblocks” in the fragments of the West Bank where Palestinians are still allowed to live. He also promises to make it easier for the people of the West Bank to get permits to travel to their own orchards, or to the next town or village, or maybe (mirable dictu!) to a nearby city. In other words, Mr. Abbas has gained a slight (and very likely temporary) loosening of Israel’s suffocating grip on the throat of Palestine. In exchange, President Abbas managed to forget that Israel has illegally kidnapped and imprisoned the speaker of the Palestinian Legislative Council, at least 28 of the PLC’s elected members, and at least 10 government ministers, half of whom it still holds. Does a “head of state” go begging for crumbs from a foreign power that is holding abducted members of his own government? If Mr. Abbas were sincerely interested in forming a national unity government with Hamas, he would not have sold their prisoners of state so cheaply. Had he been truly committed to democracy last March, he would have led his defeated party into loyal opposition in the newly elected Hamas government. By closing ranks with Hamas, Abbas and Fateh could have shown the world that Palestinians would obey their own constitution, work out their own issues, and would not be prey to outside interference or blockades. Instead, he set out to commandeer the PA’s security forces and led Fateh into the disloyal opposition they have maintained to this day. Lately he has taken the PA into new constitutional territory by claiming the unilateral power to call new elections. His Fateh-packed Supreme Court recently declared that decisions made by the current PLC are “null and void.” Fortified by a significant new supply of US weapons and training, Mr. Abbas appears dangerously close to usurping both the Palestinian constitution and the will of the people by pretending to be the sole legitimate representative of the Palestinian Authority. In following this course, Mr. Abbas has made himself available to external forces that wish to make him the ultimate spoiler of last January’s free and fair elections. The ultimate goal of these parties, Israel foremost among them, may be to trigger Palestinian civil war and fatally split the Palestinians’ national solidarity, their key to survival. Perhaps to this end, the myth that Israel has “no partner for peace” is being transformed into the myth that Israel has “only one partner for peace,” one that, under present conditions, cannot claim to represent the Palestinian people. James Brooks serves as webmaster for Vermonters for a Just Peace in Palestine/Israel. He can be contacted at: jamiedb@wildblue.net. I am not surprised by the latest Israeli method of collective punishment toward the Palestinians, especially after the majority of the Palestinians democratically elected a government that refuses to recognize the Israeli regime or give up the armed struggle against it until the Jewish state ends its vicious and illegal occupation of all the Palestinian territories and recognizes the Palestinians right to live in freedom and dignity. Israel has been employing every brutal tactic known to man against the Palestinians, in order to force them into submission, for the last 58 years and it never succeeded and now Israel thinks that it can starve the Palestinians into submission. The Israeli brutality is never shocking, because it is an occupying country and an apartheid state. What is really appalling to witness, are the Western democracies jumping on the Israeli wagon and punishing the Palestinians for their democratic choice by cutting off all the US and the European aid to the Palestinian people who are badly beaten and weakened by the Israeli occupation. In addition, the West is placing the entire burden on the Palestinian people by requiring them to renounce “violence” if they want to receive foreign aid, which means that the people who live under occupation are not allowed to fight back against the aggressor and the occupier. Thus the West is stripping the Palestinians of their human and international right of armed struggle against occupation which is recognized by the U.N. General Assembly. It is time for the US and the European Union to stop looking at the Middle East conflict through Israeli binoculars and start applying an evenhanded policy with all the parties involved in the conflict because this is the only way toward a just and an everlasting peace. Thank you for visiting AFFP… interesting points, perhaps it will start some discussions….